Rabbi Sir Jonathan Sacks, an international religious leader, philosopher, award-winning author and respected moral voice, was awarded the 2016 Templeton Prize in recognition of his “exceptional contributions to affirming life’s spiritual dimension.” Described by H.R.H. The Prince of Wales as “a light unto this nation” and by former British Prime Minister Tony Blair as “an intellectual giant”, Rabbi Sacks is a frequent and sought after contributor to radio, television and the press both in Britain and around the world. Since stepping down as the Chief Rabbi of the United Hebrew Congregations of the Commonwealth, a position he served for 22 years between 1991 and 2013, Sacks has held a number of professorships at several academic institutions including Yeshiva University and King’s College London. He currently serves as the Ingeborg and Ira Rennert Global Distinguished Professor at New York University. 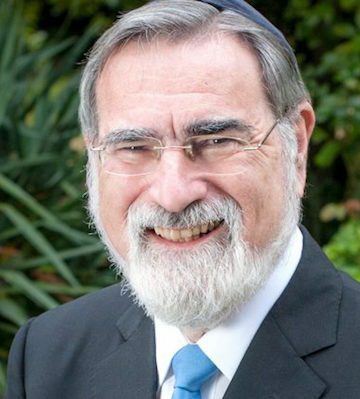 Rabbi Sacks has been awarded 17 honorary doctorates including a Doctor of Divinity conferred to mark his first ten years in office as Chief Rabbi, by the then Archbishop of Canterbury, Lord Carey. Rabbi Sacks is the author of over 30 books. Among them, he has published a new English translation and commentary for the Koren Sacks Siddur, the first new Orthodox siddur in a generation, as well as powerful commentaries for the Rosh HaShana, Yom Kippur, Pesaĥ, Shavuot and Sukkot Maĥzorim. His most recent work, Not in God’s Name: Confronting Religious Violence was awarded a 2015 National Jewish Book Award in America and was a top ten Sunday Times bestseller in the UK. Past works include: The Great Partnership: God, Science and the Search for Meaning; The Dignity of Difference: How to Avoid the Clash of Civilizations, winner of the Grawemeyer Prize for Religion in 2004 for its success in defining a framework for interfaith dialogue between people of all faith and of none; To Heal a Fractured World: The Ethics of Responsibility; and A Letter in the Scroll: On Being Jewish, winner of a National Jewish Book Awards in 2000. His Covenant & Conversation commentaries on the weekly Torah portion are read in Jewish communities around the world.